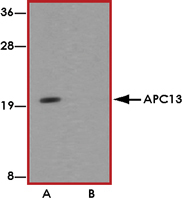 Sample Data :Western blot analysis of APC13 in Jurkat cell tissue lysate with APC13 antibody at 1 ug/mL in (A) the absence and (B) the presence of blocking peptide. 3. Schwickart M et al: Swm1/Apc13 is an evolutionarily conserved subunit of the anaphase-promoting complex stabilizing the association of Cdc16 and Cdc27. Mol. Cell. Biol.2004; 24:3562-76.